Slower second (or third) swims in an event seems to be a topic that nobody wants to discuss. After all, since these swims usually only happen at bigger meets, swimming slower isn’t something that people want to draw a lot of attention to. But it’s part of the process and needs to be looked at. For those of you who aren’t aware of the term, second or third swims refer to usually bigger meets where the swimmer makes semi-finals and possibly finals, and gets to swim the event again. A slower second swim means the swimmer swam slower than the time that got them to that semi-final or final. In other words, when it came time to perform big, the swimmer didn’t come through. As a coach, I’ve certainly seen these swims many times, and the phenomena intrigues me. Why do these slower second swims happen? And how do they happen? Why do slower second swims happen? The question of ‘why?’ appears to boil down to one or more of three things: preparation, experience, and strategy. It’s hard to imagine that veteran swimmers don’t know how to physically or nutritionally prepare for a second swim. They’d have been through it many times in the past. The important question is whether they’ve mentally prepared themselves. Bigger meets have different protocols, waiting rooms, louder fans, more pressure, etc. Visualizing and mentally rehearsing the process are some of the tools here. But again, they should all know that. For top swimmers, preparation shouldn’t be a problem, but it might be for regional level swimmers. Inexperience can be a big factor at every level, even the Olympics. Every time a swimmer reaches a new level, it’s a new experience. Some handle it without a problem, while others get distracted by the different energy and pace, by the different distractions of the media, well-meaning fans, etc. Even coaches can get rattled at big meets, and that can bleed through to the swimmer. Just watch the introduction of swimmers before an Olympic final or semi-final and you can see the different reactions to this stress. Usually, the best antidote to inexperience is … experience. Swimmers who have been there a few times will know what to expect, and will be able to bring a better focus on the race. The next best thing is visualization. Here’s where we get to the difference between racing (to win) and swimming (the fastest you can). Big meets are all about racing, although sometimes the best way to place well is to get that PB. The difference is that racing involves a pre-race strategy that can be thrown out the window if somebody makes a move you can’t ignore. So this brings us to the question of whether there is ever a reason to plan a strategy that will likely lead to a slower time. And the answer is yes! Because such a strategy may also give you a chance at an amazing time. The key to this unusual strategy is that you feel that your best won’t be good enough to meet your goal: whether its to finish high enough to make a team, win a medal, or just qualify for the next round. Deep down you know that you have to change up your race from your normal strategy and try something risky. As an example, imagine that you’re going into the Olympic trials final and realize that even doing an impressive PB won’t get you onto the Olympic team. You can either swim for a PB and know you won’t make the team, or try something reckless and hope some magic happens. Such a strategy would usually involve getting yourself near or at the front of the race at some point in order to get the adrenaline flowing. But to do this means throwing a lot of energy into the race earlier than you normally would. Too early and you may crash and burn. Too late, and you may never get to the front of the race. It’s risky. In this section we’ll determine how often slower second swims occur, and what their race profiles look like. And then as far as possible, we’ll try to determine what it looks like when a risky strategy pays off. For the purpose of this analysis we’ll be looking at the semi-finals and finals at the 2012 Olympics, and for this post, just the 100s. (I’ll analyze the 200s and longer in later posts – too much data to put all in one post). A ‘Slower Second Swim’ is when a swimmer makes it past the heats, and their time for their last swim (final or if they didn’t make that, the semi-final) is slower than one of their previous times in this event at this meet. There are 16 last swims for each event, assuming there are semi-finals. Eight finalists, and the eight semi-finalists who didn’t make finals. When we consider 4 different strokes, and both genders, we get a total of 128 last swims for just the 100s. Here’s where we get to the really surprising results. The analysis shows that 68 of those 128 swims qualify as Slower Second Swims. That’s right. 53% of the last swims in the 100s at the Olympics were slower than their earlier swims. This was a shocker for me. And for whatever reason, the short axis strokes, breaststroke and butterfly, had significantly higher numbers of Slower Second Swims. Notice that 13 of the 16 women’s 100 breaststroke swimmers and 11 of the 16 men’s 100 butterfly swimmers went slower in their last swim! And this is the Olympics. Next, we’ll look at how these 68 people split their race. Since its only 100, we only have the 50 split to work with. The question is, did they split faster or slower than their earlier, faster swim? Here we see the next surprise. I had assumed that in an attempt to get a much better time, swimmers would take the first 50 out faster and then hope they can hang on. However, the results show that 61% of Slower Second Swims actually took out the 100 slower than their earlier swim. At least to me, this doesn’t sound like a deliberate strategy. 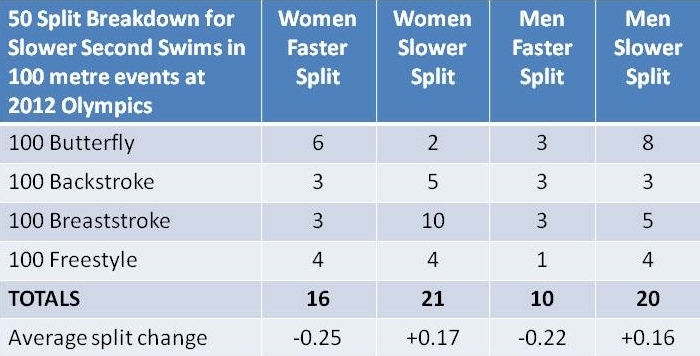 For swimmers who took the race out slower, the average split time went up 0.17 seconds. So why did so many swimmers go out slower when it really counted? I really don’t know. Another assumption I had going into this analysis was that swimmers feeling the most concern about meeting their goals would be the ones most likely to adopt a risky strategy. Meaning we should find a much higher percentage of Slower Second Swims among these threatened swimmers. I looked at the incidence of Slower Second Swims for semi-final swimmers who finished 9th-16th in heats, and for final swimmers who finished 5th-8th in semi-finals. These threatened swimmers are the ones who have to move up rankings. Threatened swimmers showed only a mild increase in Slower Second Swims when compared to non-threatened swimmers. It appears that the assumption that threatened swimmers would be the major source for Slower Second Swims is not valid. Now, let’s try to find a way to measure the opposite result. Can we identify swimmers who have gone faster than they might have expected to through the use of a risky strategy. A ‘Faster PB Second Swim’ is when a swimmer does a PB in one of their earlier swims, and then swims even faster PB in their last swim. It turns out that despite this rather strict criteria, there were some 13 such swims. Now, in order to count as adopting a risky strategy, these swimmers would have to go out faster than they did with their PBs. Here we see that there were 13 Faster PB Second Swims, with 11 of them involving a faster 50 split than in their earlier PB swim. (Note that the only 2 exceptions split only 0.02 and 0.11 seconds slower). So 11 swimmers adopted a risky strategy, going out an average of 0.22 seconds faster than their PB split, and it worked. Clearly, going out faster was a successful strategy for them. 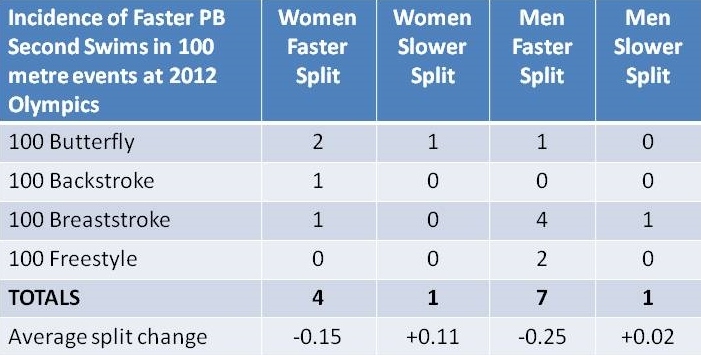 Most of my assumptions about Slower Second Swims appear to be incorrect, at least in my analysis of the 2012 Olympic 100 metre events. there were many more Slower Second Swims than I had anticipated, with a full 68 of 128 last swims being slower than an earlier swim. the majority of those Slower Second Swims were not as a result of going out faster than earlier swims, as I would have expected from those who felt they had to adopt a riskier strategy in order to meet their goals. They went out slower in their final swim. Lastly, there were swimmers who achieved two PBs in the event, and the vast majority of those did so by going out faster on the second PB. Based on the above results for the 100 metre events, my feeling is that swimmers who need to improve their time in a second swim should plan their race aggressively. Many, many years ago I barely made it into our 400 IM Olympic Trial final. I knew that I would need to take at least 7 seconds off my PB to have even a remote chance to make the Olympic team. And I knew that my usual race plan wasn’t going to be good enough to do that. Because breaststroke was my weakest stroke, and the field had numerous strong breaststrokers, my coach and I felt that I had to have the lead at the end of the backstroke. Then see what I could do from there. I managed to get that lead, splitting at the 200 much faster than I had ever done before, but I just couldn’t sustain the effort and wasn’t close to making the team. I have never had any regrets about that race or that strategy. I went for it, gave myself a chance, and just wasn’t good enough. Slower second swims can still be rewarding in their own way. Next Post What’s the Best Way to Start Off a Swim Season?